Gators. Gainesville. Goes together, right? Moreso than you’d ever imagine. That’s why it’s time for a ramble into Paynes Prairie Preserve State Park on the La Chua Trail. 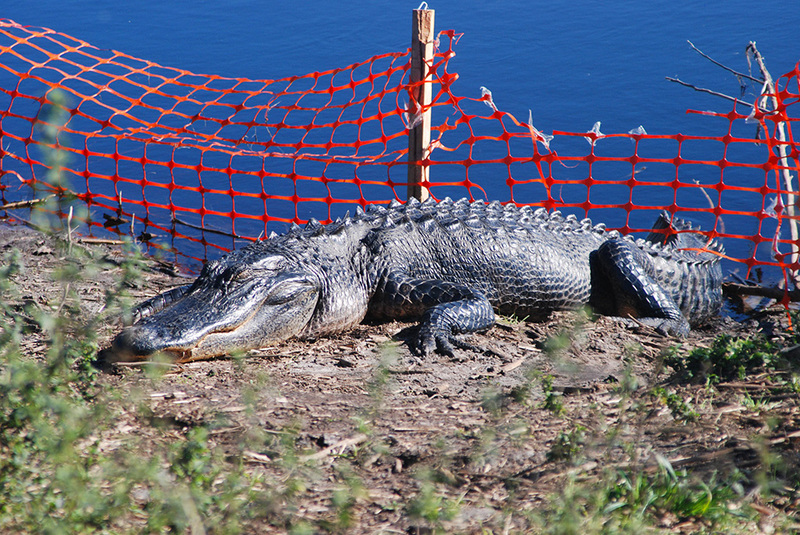 It’s been a word-of-mouth thing for decades – students bringing friends to see the giant alligators, friends telling friends, students impressing visiting parents – which is why you’ll always find people rambling down one of the freakier trails in Florida. The first part of the hike is mellow enough, a sidewalk winding through the woods from the parking area to the park’s pedestrian entrance, intersecting the Gainesville-Hawthorne Trail along the way. It’s a $4 per car fee to enter this massive Florida State Park by its north entrance. It’s worth it. Warning signs give you the rundown. Watch out for wild bison – they roam free on Paynes Prairie – and don’t bring dogs here, as alligators find them far too temping for a snack. It’s also prudent to keep your small children in a stroller or in your arms. This is not a place you or your kids want to go exploring off-trail. This is where the wild things are. The La Chua Trail comes in two flavors: spectator and participant. For the first half mile, you’re a specator, watching nature below you. 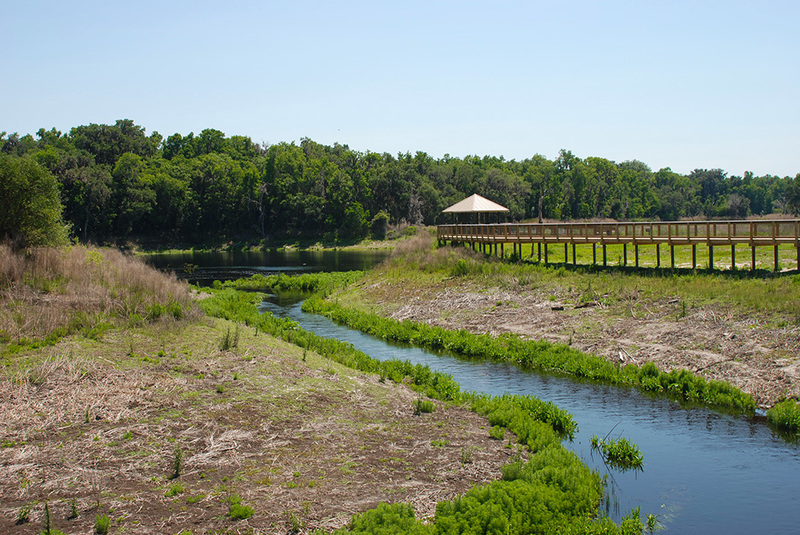 it’s an easy boardwalk with rain shelters and views down into the sinkhole into which Paynes Prairie drains. When the water is low, you can see it pouring into the throat of the sinkhole like a waterfall. At other times, it’s a slow and steady drain into the Floridan Aquifer. In either case, egrets and herons tend to pick along the shoreline. 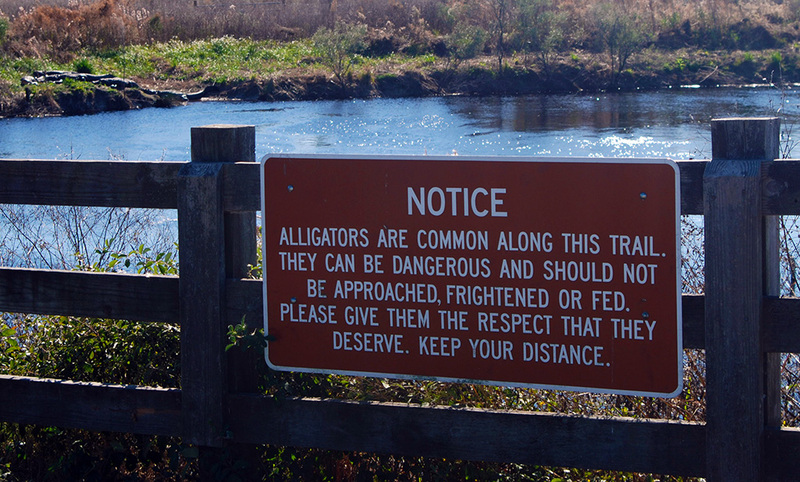 As the boardwalk follows a sinuous creek upstream, you start to see alligators along the banks. Especially on a sunny day. Start counting. I’ve logged over a hundred in a single hike. Once you reach the shelter perched on the edge of La Chua Sink, scan the shores. On warm, sunny days, it looks like alligator soup in the shallows. At the end of the boardwalk, you become the participant. Here’s where the cautions apply, especially the one about minding your children. 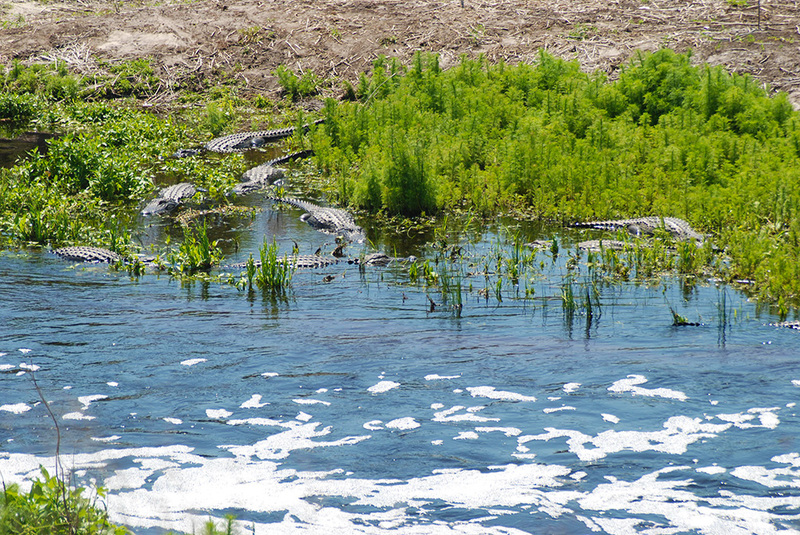 Steep bluffs drop off into a small chasm where giant gators sun along a fast-moving stream draining the prairie. The natural surface trail follows a levee for a mile to an observation deck in the vastness of Paynes Prairie. Once you walk through the old cattle ranch gate, that levee isn’t far off the ground. 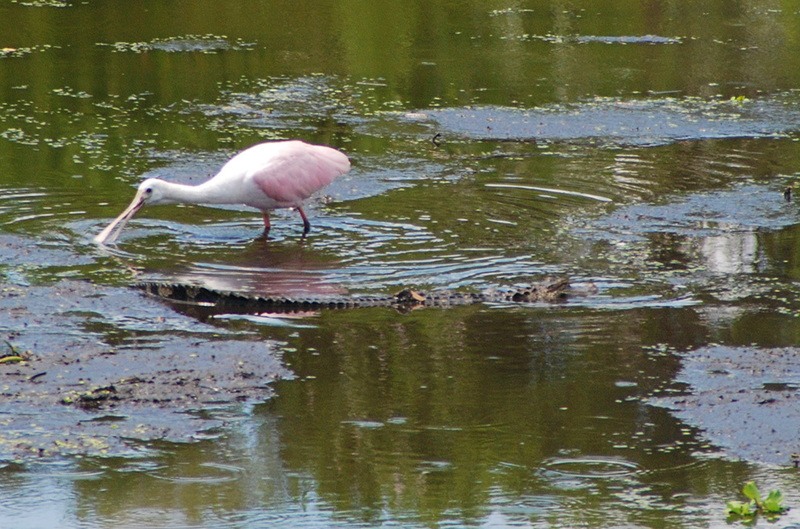 And at ground level, in the sluggish waters, the alligators swarm. At any time of year, bird life is rich, but it’s during the winter months that the migratory species alight. In the open mud flats you may see a flock of white pelicans, brightly colored roseate spoonbills, or even a pair of whooping cranes. Bald eagles and osprey are surprisingly common along the prairie. As you walk out to the tower and back, you’re now truly in the home of the gators. Keep alert. And don’t walk along staring at your smartphone, because you never know what you might not want to trip over. Share those photos afterwards to impress your friends.